While Hannes Arch, co-architect of HARMAN’s AKG AV100 aviation headphones, was the winner of the Red Bull Air Race in Rovinj, Croatia, the moderator’s bench was left wanting for nothing with their own set of HARMAN’s AKG wireless microphones, headsets and in-ear monitoring systems. The AKG systems enabled flawless communication on and off the racecourse during the commencement and winner ceremonies. 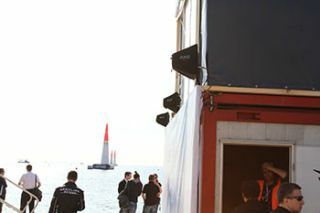 The system at the Red Bull Air Race featured the AKG DAM+ Series gooseneck microphones, equipped with CK49 capsules for the desks, capturing the sound of live commentators and the winners of the contest. The capsule is designed to capture the best sound in any indoor and outdoor environment, honing in on voices at greater distances, and reducing pop noise at short distances. Combined with the AKG WMS4500, DHT700 and DMS700 wireless microphone systems, the announcers were well-equipped for the show.